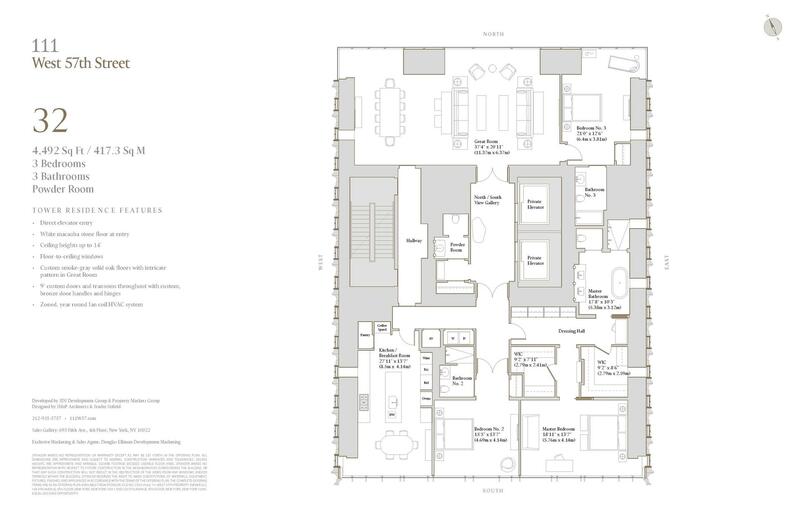 This gracefully proportioned, full-floor 4,492 sq ft Tower Residence with three bedrooms and three and a half bathrooms is designed for elegant living on a grand scale. Its richly detailed finishes are conceived throughout by Studio Sofield, and demonstrate an extraordinary commitment to traditional materiality, quality and craftmanship. A formal central entrance gallery with white macauba stone floors offers and views to both north and south. Double macassar ebony doors open into the spectacular Great Room, which boasts monumental ceiling heights of 14ft and intricate parquet floors in custom smoke-gray solid oak. Partial Great Room views of Central Park are showcased by floor-to-ceiling windows framed in bronze. The expansive eat-in corner kitchen with south-western exposures features custom designed cabinetry finished in hand-rubbed plaster and chateau gray oak. The countertops and backsplash are stepped crystallo white quartzite, and appliances by Gaggenau include convection and steam ovens, a gas range with pot filler and vented hood, a fully integrated coffee machine, two dishwashers and a side-by-side refrigerator and freezer. A corner master suite with southern city skyline views is luxuriously appointed with two generous walk-in closets, a dressing hall and a windowed master bath with walls and floors in veined white onyx. Custom bathroom fixtures include a freestanding polished nickel bathtub by William Holland, exclusive Studio Sofield-designed bronze fittings hand-cast by P.E. Guerin, and bronze sconces. The glass-enclosed, windowed shower features dual showerheads and body sprays in bronze. The secondary guest bedroom also enjoys southern views; the third has exposures to the north and east. Two full guest bathrooms are finished in crystallo gold quartzite and silverian pearl marble, while the powder room features a stone vanity, floors and wainscoting in jewel onyx.